Have you ever been locked out of your home, your car, or your business? Have your keys disappeared? We understand how frustrating it can be to be locked out or missing your keys! This is why we offer 24-hour locksmith services for Spring, the Woodlands, and the surrounding areas. But why call Affordable Locksmiths of Texas? When you contact us online or call us, we guarantee that we will call you back within 15 minutes. Our locksmiths understand that when you are locked out that it often comes at the most inconvenient time; that is why they have made themselves available as 24-hour locksmiths. We don’t want you standing around, locked out of your car at night, wondering what to do. We don’t want your business to suffer simply because you can not gain access; we want to help you get back in your home without having to resort to extreme measures and the expense and stress that comes with that. Call our reliable 24-hour locksmiths! You know when you call us that we are 24-hour locksmith that is licensed, meaning not only that we know what we are doing, but that you can also trust us and trust is of the utmost importance. If you are locked out of your car late at night, you don’t want just anyone to help you unlock your car. Also, when you have someone making a copy of your key, you want a professional locksmith who you can trust handling your keys and other elements of your security. 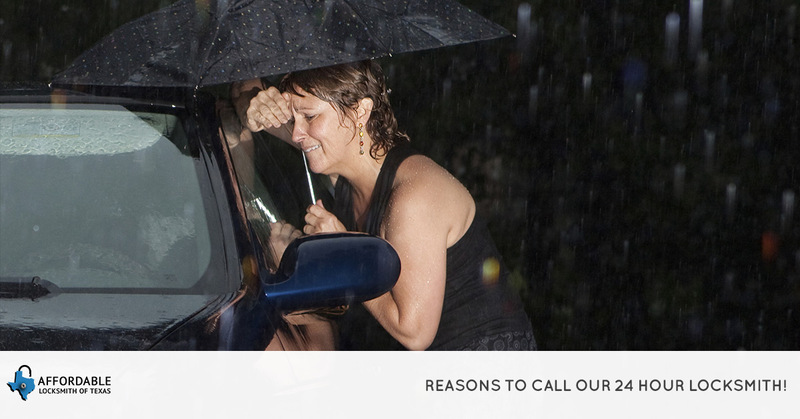 Our 24-hour locksmiths want you to feel safe no matter what situation you find yourself in. Another reason to give Affordable Locksmith of Texas a call is that we have the experience to get the job done well. We have been in the business for over 10 years and only hire locksmiths that reach our high-standards for quality of work, ethics, and customer service. Our 24-hour locksmiths are equipped to get you in and on your way in no time and get you back in your car, home, or business the right way. Our locksmiths offer 10 years of experience serving Spring, the Woodlands, and the surrounding areas with our professional residential, commercial, auto key services. Our experience is backed by the importance we place on customer service. If our customers aren’t happy, we did not do our job. We want our customers to feel satisfied with the quality of work and by the experience they had working with our 24-hour locksmith. Been locked out and want to know what you should do next? Ask us! We would love to help you know what you need to do to stay safe and keep your home, business, or property secure. We know that often you need 24-hour locksmith services when you least expect it and not always when you are financially able. We want you to worry less about how much it costs to perform the task that is needed, and more about getting what you need. This is why we offer our clients affordable solutions to their issue and all new clients receive 10 percent off their first service! Call us day or night! One of our 24-locksmiths would love to help you! We also other high-quality locksmith services for your home, business, car, and more! We can even help with transponder replacement. Unsure if we can help you or not sure what solution you need? Contact us!